This one is exactly a week old, but it is still a telling story. Upon his return to his hometown of Brežice, Slovenian Olympic gold-medalist Primož Kozmus was greeted by more that 5000 fans and a couple of politicians, including Prime Minster Janez Janša, who was – somewhat surprisingly – booed throughout his short speech. Surprsingly, because booing at politicians is not exactly commonplace in Slovenia. Indeed I’d venture to say that even Milan Kučan at an SDS even would receive a warmer reception (OK, I may be pushing it here :)) And secondly, because Janša’s SDS carried Brežice by a huge margin in 2004 elections (it got some 44% of the vote) and yet Janša was received by a definite lack of enthusiasm. A Turning Point In Election Campaign? Apparently it wasn’t just pengovsky who wasn’t all that impressed by Borut Pahor’s perfomance Wednesday last. Dnevnik ran a poll on Saturday where Janša’s SDS for the first time in more than six months enjoys a small-but-distinctive lead over opposition Social Democrats. 1.9 percent might not seem a lot – and is still very much within the margin or error – but in terms of a dead heat between SDS and SD we’ve been seeing for the past few weeks, this is quite an important shift. 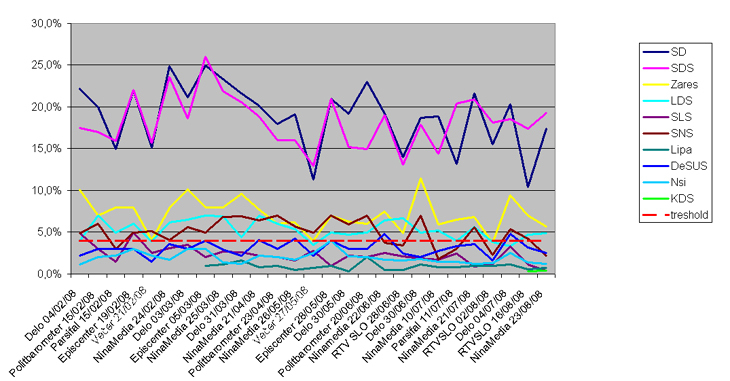 Namely, Pahor’s SD got 17.4 percent, while Janša’s SDS got 19.3 percent. This could very well be a turning point in this election campaign. On one hand Borut Pahor and his SD have more than enough time to rectify things, on the other hand, however, they don’t have enough time to wait for another poll and act then. One more result like this and the glow of victory surrounding Pahor at the moment will have diminished dangerously (dangeroulsy for his prime-ministerial ambitions, that is). The same thing happened in presidential elections a year ago, when Lojze Peterle was long thought of as having already cliched a victory, but as he didn’t win in the first round, he had to reposition himself, but by then he was no longer thought of as invincible and unbeatable (with a little help of Janez Janša becoming as unpopular as he was ever going to get). Today, with 26 days until elections this is the worst possible time for Pahor to have to make a come-back in polls. Because if he looses the aura of PM-apparent, he is facing an extremely uphill battle. Luckily for him, the three parties of the left bloc (SD, Zares and LDS) still enjoy a comfortable lead over the three right wing parties (SDS, NSi and SLS). Pengovsky’s projection:: This could very well be it. If Pahor and SD don’t do anything about it (or go about it the wrong way) it can all go downhill from here. It is highly likely that Borut Pahor will adopt a more hard line rhetoric, but if he overdoes it, it will backfire, alienating moderate voters. Also, as he did a rather poor job at citing numbers, Pahor will probably do a crash-course in economy or (sligthy more likely but less effective) will stand firmly alongside Mitja Gaspari as the latter will try to tear the economic policies of this government to pieces. Pengovsky eagerly awaits next polls. Election 2008 badge: Will be updated during the day. Data: Is avilable in MS Excel file. Yesterday’s opening debate between PM Janez Janša and leader of the opposition Social Democrats Borut Pahor was a suprisingly one-sided event. Borut Pahor failed to challenge Janez Janša even once and although the former did attempt to throw around a couple of figures, he never stuck to them, but mostly answered Janša’s rebuttals with “well, we will have to check that”. Now, fair’s fair and it has to be said that Janša didn’t do a brilliant job either. 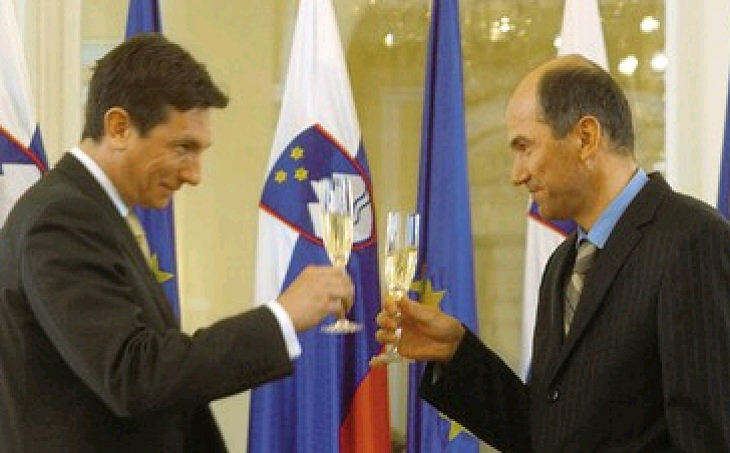 He was, however, much more effective in bringing his point accross, mostly in terms of trying to make a connection between Boško Šrot (of Laško Brewery) and Borut Pahor. Here the leader of SD was on a constant defensive and was looking for a quick way out. On the other hand, when the debate turned to the Janša – Sanader affair, Pahor insinuated to be in posession of certain information but supposely remained quiet for the better good. Which might be very noble of him, if it weren’t for the official conclusion of the parliamentary committee, which says that Janša indeed communicated with Croatian PM Ivo Sanader just prior to 2004 elections (and subsequent Janša’s victory), but that the two did not arrange for borded incidents. One would think that international relations would be one of the fields where Pahor would excel. He was, afterall, a serious contender for the post of Foreign Minsiter on several occasions, he does have the knowledge, the diplomatic attitude and clothes to match. He also majored in international relations (his thesis dealt with international terrorism, and that was more than twenty years ago) and is an MEP at the moment. And yet Janša was not taken by surprise when both were asked whether and if, how, would they Croatian EU aspirations to solve Slovene-Croat border disputes. Pahor gave a very honest (and in my oppinion very good) answer, saying that he would do no such thing, adding that Slovenia has many other leverages within EU and that it should not use Brussels to solve a bilateral problem. Janša on the other hand eluded a direct answer, saying that Croatia has similar problems with Bosnia, Serbia and Montenegro. And agian, Pahor missed an opportunity to point out failures of PM Janša and his Foreign Minister Dimitrij Rupel which are not all that few-and-far-between. There was one field where Pahor had Janša pinned to the wall, so to speak. He was very persistent in pointing out that he would be far better a prime minister than Janša was. Which isn’t saying much, mind you. But even so, it would be nice to point out how exactly would Borut Pahor be a better PM. Again, he tried to to that, but with limited success. I’ll give Pahor credit for sticking to his mantra of not commenting the media at all (as opposed to Janša’s urge to control them), but here Janša coutnered that they were not all that different, Pahor and he. To which Pahor failed to mention Delo takeover, control of state television, Janša’s one-on-ones with pro-government journalists, two free-of-charge rags, disguised as newspapers, supposedly written by journalists which are most likely SDS party faithfuls who have never written an article in their lives, the statement by FM Dimitrij Rupel that “countering the goverment will cost dearly any media which would dare do so”, et cetera, et cetera. But still, Pahor said that he would be a much better PM. And for finale, they both embarked on a poor-me-journey, sobbing about how much each of them hurt when a) Janša was portrayed by members of Social Democrats as a traitor for his confabulation with Croatian PM Sanader and b) Pahor was portrayed by Janša as a media control-freak because Boško Šrot was a member od SD. This particular part was – this must be said – difficult to watch, because there they were, two middle-aged men both trying to persuade the people that they are the right choice for the top job and…. they get misty-eyed??? I almost went Boys, get a room! So. Janša won this opening match fair and square. Pahor’s attacks were feeble, defence practically non-existant. There were a couple of solo-attempts, but they ammounted to surprisingly little. However, this match was palyed on Janša’s home turf (state television). It will be interesting to see how they both fare on POP TV. If Janša agrees for a duel, that is. Rumours have it that he is looking for a way out of it, not in the least because the moderartors there will most likely resemble a pack of rabid pit-bulls and give Janša and everyone else precious little room to breathe. But – in Pahor’s words – we’ll have to check that. Prime Minister Janez Janša of Slovene democratic party (SDS) and leader of the opposition Social democrats Borut Pahor go head to head today in a debate televised on TV Slovenia. It should be interesting to see first hand how the PM and his challenger differ in substance and style. Did I say first hand? Ooops! That’s me being naive… Namely, the debate will not actually be televised, but was rather pre-recorded on Tuesday night and will be aired today in prime-time slot. Hopefully, the host of the show Tarča (Target) during which the debate will take place will keep the content intact. Although I’m troubled by the fact that a pre-election debate will not be aired live. Pre-election debate? Not really. By law RTVSLO must give equal time to any and all political parties which run for parliament. But as the campaign starts on Thursday, a fist-fight between Janša and Pahor was scheduled for Wednesday (today) to circumvent those nasty election laws. 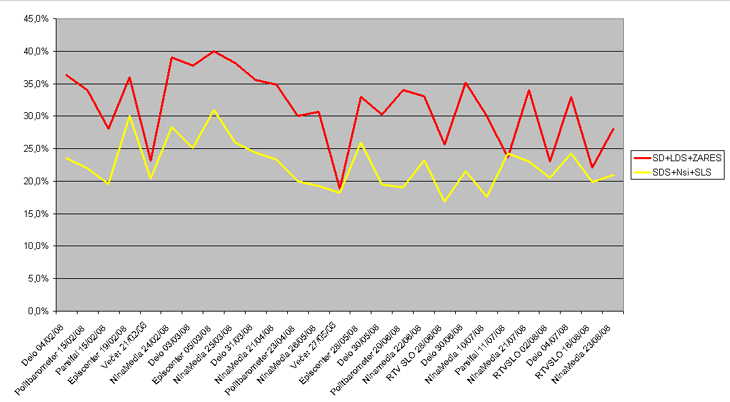 It’s been a while since pengovsky posted on public opinion polls and we’ve had two od those in the last 14 days, one by Delo (on 3 August) and one by RTV Slovenija on 16 August. 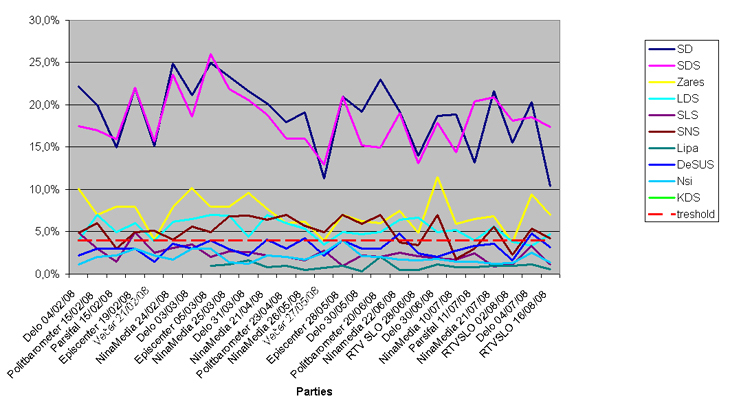 Please note that I consider RTV SLO and it’s pollster Interstat a problematic duo, but I include their polls nevertheless – for the moment I give them the benefit of the doubt. You will notice Social Democrats’ ratings going up and down like a cork in the water. 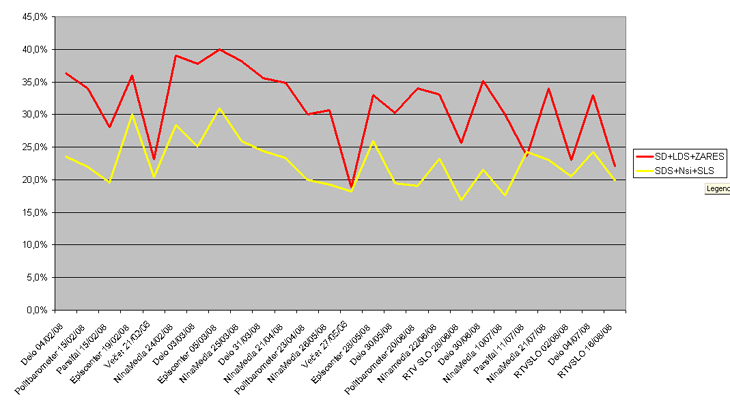 This is obviously a result of RTVSLO moving up the pace of its polls, and since leaders of the left bloc Borut Pahor, Gregor Golobič and Katarina Kresal (of Social Democrats, Zares and Liberal Democrats respectively) went on the record that a coalition with PM Janša’s SDS is out of the question, a whole new dynamic in pre-election rhetoric emerged. Specifically, Janez Janša is starting to make nervous noises about the possibility of his party taking the top spot and not getting the mandate for forming the government. To coutner that, said Janša, SDS must win big and not by just the slightest of margins. As we know this might prove a tad difficult, as SDS seems to have canibalised all the votes it could off of SLS and NSi, while making little progress in enlarging the voting base of the right wing option as a whole. So Janša and his party are afraid that President Danilo Türk (himself supported by SD, Zares and later on by LDS in the presidential elections) might give the mandate to form the government to the party which will clearly be capable of forming a ruling coalition and not (as per convention) to the relative winner of the elections. The trick is, that – given the projected distribution of votes – whoever gets the mandate will very likely form a ruling coalition one way or another. So it goes without saying that the thought of circumventing this unwritten rule of forming the governement has crossed many minds on the left side od the political spectrum, and Janša apparently got the wind of it. So if SDS does come on top eventually (as many people believe it will), then it is only right that PM Janša gets another shot at forming the government. The task just might prove to be a bit more difficult than it sounds and even if he suceeds, he would be presiding over a politicaly very diverse government, in constant danger of falling appart. Pengovsky’s projection: Regardless of the actual perctentage, SD and SDS will continue to battle it out until the last day of election campaing, knowing very well that whoever gets the top spot will most likely form the government. I really think that any sort of shennanigans with giving the mandate to the party which would come in second would be an extremely bad idea. Data is available as an MS Excel file. Election 2008 badge is updated to reflect the last available poll (RTV SLO), although I stress again that its results are problematic at best.